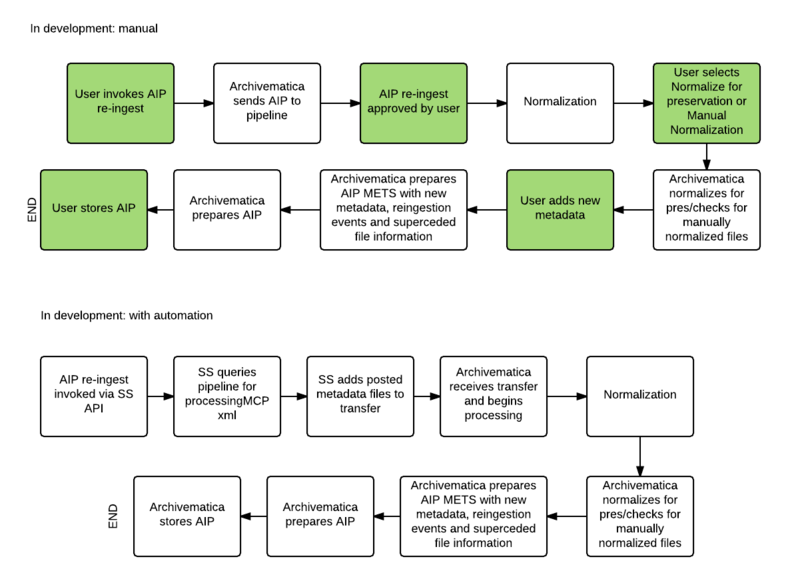 This page documents requirements for retrieving an Archivematica AIP from archival storage and re-ingesting it for further processing. To be supported in version 1.6. Sends an AIP to the beginning of transfer to run all micro-services on AIP, and re-normalize for preservation and access if desired. Supported in version 1.5. Sends an AIP to the beginning of ingest to allow user to update metadata. Supported in version 1.5. 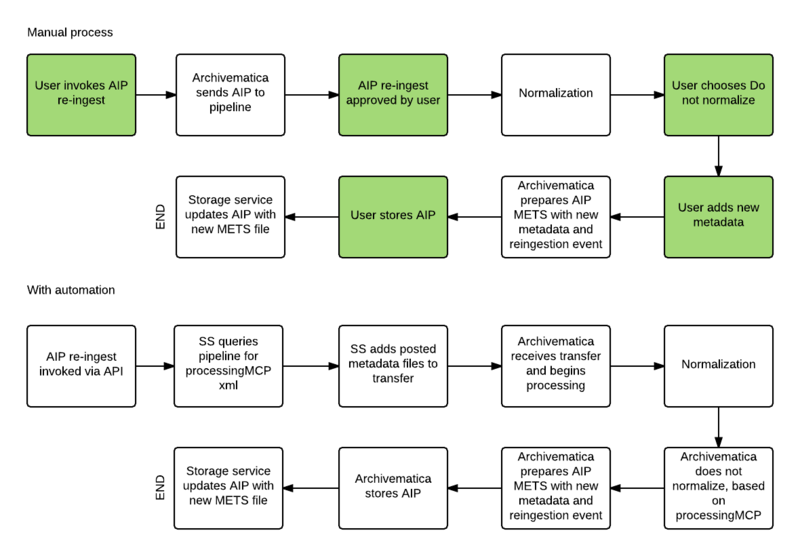 Sends an AIP to the beginning of ingest to allow user to update metadata and normalize for access. Versioning will be captured via METS file updates. METS file updates will be handled through <status>, <created> and <groupID> attributes in the various METS sections. See for example Element <dmdSec> at http://www.loc.gov/standards/mets/docs/mets.v1-9.html. This means that there will always only be one AIP METS file, but it will contain both superseded and current metadata and versioning information for all updates. The first dmdSec created will be marked as status="original", and updated/revised dmdSecs will be marked as status="updated". The timestamp (created="[date/time]") is also updated. After re-ingest, the original techMD will contain the PREMIS:Object metadata and the status="superseded." The next techMD will be status="current" and contain the PREMIS:Object metadata generated on re-ingest, as well as all PREMIS events from each ingest and re-ingest. This shows the complete set of actions taken upon the objects since they came into the repository. The timestamp (created="[date/time]") is also updated. After re-ingest, the original rightsMD will have the status="superseded" and the revised rightsMD will have the status="current". Altering either the rights statement or the act(s) will result in a new rightsMD. The fileSec does not indicate its status, but should reflect the files in the AIP currently. For example, if normalization is not performed on the first ingest, but is performed on reingest, the fileSec in the reingested AIP will include preservation derivatives.